If you have FastFilms and have upgraded your computer operating system or moved to Photoshop CS4, CS5 or CS6 then you will need to upgrade to T-Seps. You can download the Free Trial and pay for the upgrade here. It's easy! T-Seps. 2.0 is just what you need to take your company to the next level. T-Seps automated color separation plugin for Adobe Photoshop now works in Photoshop version 6.0 to 13.0 (CS6) on the Windows/PC and Mac. It has been totally re-written and updated to work on ALL computer systems - both 32-bit and 64-bit up to CS5 on Mac and PC platforms! T-Seps 2.0 is in FIVE languages - English, Spanish, French, German and Portuguese. It is the next generation of the popular program FastFilms. Upgrade FastRIP or T-RIP 1.0 or 1.2 to T-RIP 2.0 here. Faster, easier, print with all black! Whether you are a small shop with no more than 13" x 19" inch film needs or a large production shop with a 44" printer outputting a lot of films every day - we have a RIP for you. The NEW T-RIP is based on the same technology and programming that we developed at U.S. Screen Print & Inkjet Technology with our very popular FastRIP. Although FastRIP was sold as a Windows or Mac version, there is no longer a Mac version available. We do have users running T-RIP on a Mac using Windows emulation programs like VM Ware. You need to have Windows installed on your Mac to use this method. For more details on how to use a Mac with T-RIP send email to info@tbiznetwork.com. T-RIP 2.0 works on Windows 7, Windows 8/8.1 and the new Windows 10. If you have the older FastRIP or T-RIP 1.0 or 1.2 you will have to upgrade to T-RIP 2.0 if you go to Windows 10 . Go to the T-RIP Features page for more details. If you want to upgrade from T-RIP 1.0 or 1.2 to T-RIP 2.0 the price is the same as the FastRIP upgrade and you would order it here. • FastRIP used a dongle as the security key. T-RIP does NOT need a dongle but you must have a dongle and number that we can verify. Without a dongle number you can't upgrade from FastRIP to T-RIP. And, T-RIP can only be put on one computer at a time and that computer must be online when you install T-RIP for the unlocking process to happen. Once unlocked the computer does not need to be online. • In order to confirm that the upgrade works on your system, you should download the Trial version here. When we get your order and payment we will email special License Files that you simply copy to your computer. These files unlock you for the upgrade version you have purchased. Allow up to 48 hours to receive the license files (the Trial works for 15 days). IMPORTANT NOTE: We no longer ship CD's of T-RIP. The packaging and CD in the picture if to give a visual reference of the product only. This product can be downloaded as a 15-day free trial from www.T-BizNetwork.com/downloads/ and after a purchase is made we send out a PIN code to unlock the free trial. We are now including the complete T-ART DVD with a purchase of an upgrade or full version T-RIP. The DVD includes over 500 high-res images and is at least a $99 value. IMPORTANT SECURITY INFORMATION: T-RIP is a SINGLE USER program only. This means it can only be installed on one computer. During the installation your computer's "machine number" is sent to our server and the unlocking PIN you received is based on that. You can't easily move T-RIP around from computer to computer. If you have to do a re-install on the same computer that is no problem. If you want to move T-RIP to a different computer you need to notify us so we can deactivate the current installation and authorize a new installation. If you prefer to have a dongle security key in order to easily move T-RIP from computer to computer then there is an additional $50 fee. Contact support@tbiznetwork.com for details. There are TWO T-RIP versions available. The version you need depends on your printer model. Printers supported:Epson 1400, 1410, 1900, 3800, 3880, 4400, 4450, 4800, 4880, 4900, Artisan 1430, D120, SP-1400, SP-1410, SP-1500W, SP-2200, SP-2880, R1800, R1900, R2000, R2400, R3000, SC-1520, SC-3000, SC-P600, SC-P800, SC-T3000, Stylus 1100, Stylus Pro 4000, WF-7015, WF-70xx, WF-75xx. Epson 1400, 1410, 1900, 3800, 3880, 4400, 4450, 4800, 4880, 4900, 7400, 7450, 7700, 7800, 7880, 7890, 7900, 9400, 9450, 9700, 9800, 9880, 9890, 9900, 10000,10600,11880, Artisan 1430, D120, SP-1400, SP-1410, SP-1500W, SP-2200, SP-2880, R1800, R1900, R2000, R2400, R3000, SC-B60xx, SC-P6000, SC-1520, SC-3000, SC-P600, SC-P800, SC-P7000, SC-P8000, SC-P9000, SC-T3000, SC-T3000, SC-T3200, SC-T3270, SC-T5000, SC-T5200, SC-T5200D, SC-T5270, SC-T7000, SC-T7200D, SC-T7270, Stylus 1100, Stylus Pro 4000, Stylus Pro 7600, Stylus Pro 9600, WF-7015, WF-70xx, WF-75xx. T-Seps. 2.0 is just what you need to take your company to the next level. T-Seps automated color separation plugin for Adobe Photoshop now works in Photoshop version 6.0 to 13.0 (CS6) on the Windows/PC and Mac. It has been totally re-written and updated to work on ALL computer systems - both 32-bit and 64-bit up to CS6 on Mac and PC platforms! Upgrades are free to T-Seps owners. PLUS, T-Seps 2.0 is in FIVE languages - English, Spanish, French, German and Portuguese. It is the next generation of the popular program FastFilms. Starting with T-Seps 3.0 the program has a new look and feel and is the next generation of the T-Seps and FastFilms family. The program has been improved, updated, new routines added, and it now includes a much easier to use graphic interface. T-Seps 3.0 ONLY works in Adobe Photoshop CS6 or CC. If you have CC 2015, 2015 or 2015.5 then you need T-Seps 3.5.5. Simply tell us at checkout what version of Photoshop you have. For years and years T-Seps has worked in the Actions panel of Photoshop using simple buttons to perform tasks. 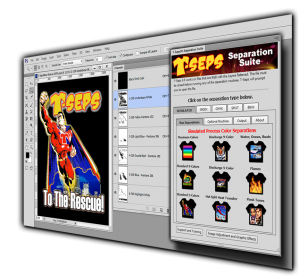 The new and improved version of T-Seps is now called T-Seps 3.0 Separation Suite and/or T-Seps 3.5.5 Separation Suite - and it has an entirely new graphical interface and it works in its own Photoshop panel. You are really going to like this! T-Seps 3.0/3.5.5 Separation Suite is the next generation of the T-Seps and FastFilms color separation software family. T-Seps 3.0 and 3.5.5 has been totally re-worked, updated and greatly improved to work in Adobe Photoshop CS6 through CC 2015.5 (Mac or PC) and is a full suite of separation and graphic effects programs. If you are new to T-Seps you will find this magic program will take your company to a new level in print quality and customer satisfaction. If you are a current user of T-Seps or its older brother, FastFilms, then you already know the power of the program. Click on images on the right to see larger view. IMPORTANT NOTE: We no longer ship CD's of T-Seps. The packaging and CD in the picture if to give a visual reference of the product only. This product can be downloaded as a 20-day free trial from www.T-BizNetwork.com/downloads/ and after a purchase is made we send out unlocking codes once you confirm the installation and send us the auto-generated Request Code. Refer to the T-Seps Manual for more details or go to www.T-Seps.com. T-RIP DTP is based on the same technology and programming that we developed at U.S. Screen Print & Inkjet Technology with our very popular FastRIP. In fact, we are also offering upgrades from the popular FastRIP program for the defunct U.S. Screen Print. Upgrade from FastRIP to T-RIP here. T-RIP is a software RIP (raster image processor) designed to make an inexpensive inkjet printer create very accurate and dense film positives very similar to much more expensive imagesetters. And, it works with Adobe Photoshop, Adobe Illustrator and Corel Draw. It is ONLY a Windows based program and does not work on Mac although we are still testing using it under Windows emulation on a Mac. T-RIP works on Windows 7, Windows 8/8.1 and the new Windows 10. Note: If you have the older T-Rip 1.0 or 1.2 it will not work in Windows 10 and you will have to upgrade. Without a RIP an inkjet printer will not print halftone dots and will not lay down enough ink for a solid/dense film positive for screen burning. This is especially important when trying to burn small halftone dot. T-RIP gives complete control over the halftone frequency/line count, dot angle, dot shape, and more. T-RIP includes registration targets, film labels, and has settings for a variety of output resolutions and ink deposits. If you want DENSE black films with great looking halftone dots, this is it. Go to the T-RIP Features page for more details. The popular inkjet printer for screen printers is now the Epson 1430. This printer prints 13" x 19" films and has become the new standard for output devices. This printer is available online and from most online Epson dealers. With T-RIP and an Epson 1430 you can have a high quality film output system for around $800! And, this version does NOT require a dongle! You can order T-RIP on this page. If you need more details or to download a FREE Trial go to the main T-RIP page here. There are TWO T-RIP versions available. The version you need depends on your printer model. Note, we have recently included the Epson 4000 series of printers in our DTP version.